Pictured left to right, starting with the Buckeye Boys’ State attendees: Kyler Mount, Jared Murphy, Blake Pittser, Seth Leach, Todd Peterson, Griffin Shaw, Alex Patel, Chance Oyer, Nick Elrick, Levi Davis and Liam Downing. Not pictured is Colton Karnes. In the front row are Charles “Buck” Harris (American Legion Post #653), Dave Frederick (Commander, American Legion Post #25), Robert Malone (Veterans of Foreign Wars Post #3762), Edward Fisher (Selection Committee member), and Paul Sands (Fayette Masonic Lodge #107). 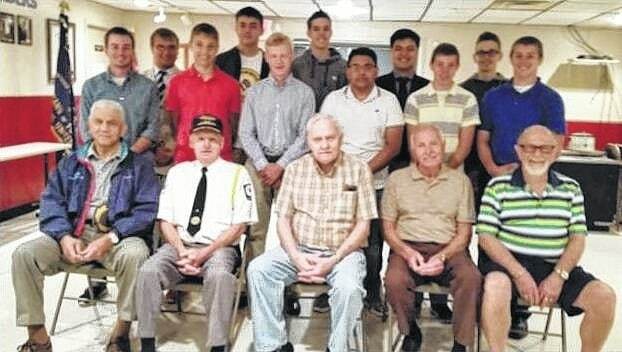 Sixteen high school juniors were chosen to represent Fayette County at this year’s American Legion Buckeye Boys’ State held on the campus at Bowling Green State University. A majority of the boys and their families were present at a morning gathering at the Veterans of Foreign Wars Post #3762. This annual event is sponsored in part by all the veteran posts in Fayette County. The American Legion Boys’ State is a national educational opportunity. However, consistently Ohio has more participants in this learning experience that any other state. The program is an opportunity for young people to learn about city, county and state government through a non-partisan, objective, educational opportunity. There is also a Buckeye Girls’ State. A few of the parents shared their thoughts about the experience: Jared’s mother, Sharon Evans, shared her appreciation for “how respect and honor for America was taught without all the politics.” Liam’s father, Tim Downing, wanted to thank the Fayette County veterans for “this opportunity for his son.” Colton Karnes, unable to attend, sent a letter with his father, Brian, so he could share his feelings about his experience. https://www.recordherald.com/wp-content/uploads/sites/27/2016/08/web1_BuckeyeBoysState.jpgPictured left to right, starting with the Buckeye Boys’ State attendees: Kyler Mount, Jared Murphy, Blake Pittser, Seth Leach, Todd Peterson, Griffin Shaw, Alex Patel, Chance Oyer, Nick Elrick, Levi Davis and Liam Downing. Not pictured is Colton Karnes. In the front row are Charles “Buck” Harris (American Legion Post #653), Dave Frederick (Commander, American Legion Post #25), Robert Malone (Veterans of Foreign Wars Post #3762), Edward Fisher (Selection Committee member), and Paul Sands (Fayette Masonic Lodge #107).